Production of section rolling rolls, including those made of nodular iron, has been assimilated at OAO ZSMK. The process of making high-quality castings, starting from melt treatment with a specially developed magnesium-containing composition, has been worked through. The inoculating composition promotes graphite globularization and, accordingly, enhancement of structural strength of rolls. A process of making pattern tooling from polymer materials has been assimilated. The process includes three basic steps: making a standard pattern or master pattern; making a negative pattern or propattern; making industrial patterns, pattern sets, core boxes. The accumulated experience allows making patterns and core boxes of virtually any complexity in the shortest possible time. 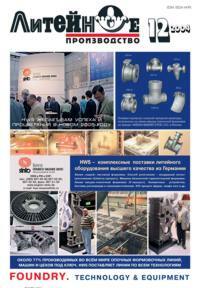 The formation of surface non-impregnation of composite castings has been researched. The filler cooling in metal mould has been investigated theoretically and experimentally. It is proposed to predict depth of surface non-impregnation and assign machining correctly. NIAT has proposed a technological solution that allows controlling the formation of a regulated structure, and, consequently, casting properties: in particular, using a fluidized cooler comprising a controlled gas medium with a solid phase in the form of granular material with a specific granule size. The conducted investigations allowed making practical recommendations. A very important issue is elucidated - V-process mold flask walls strength analysis. By using the analysis results in practice it is possible to verify the correctness of the choice of flask walls material, and to reduce their parameters, in particular, the thickness, thereby reducing the total mass of the flask. The hypotheses and circuits(scheme) of allocation of shift efforts (voltages) and frictional force between elementary volumes of sand during process of compaction of the foundry moulds and cores is described (are offered) . The algorithm (principle) of calculation by a method of finite differences (FDM) for their account, analysis and synthesis within the framework of a system approach (method) at a simulation modeling of compaction is described (is circumscribed). On the basis of conducted investigations, there have been found mathematical dependencies of cast iron chill on such factors as chemical composition, pouring temperature, wall thickness. The actual values of cast iron chill calculated by those dependencies have a good convergence, which indicates their validity and suitability for calculations under production conditions. Methods and results of calculating metal consumption in each feeding gate and the entire gating system when discharging from above from the feeding gates into the mold and when filling under the flooded level are set forth. It is shown how the coefficients of resistance to friction, local resistances and to varying head are determined. The notion of reduced feeding gates area is introduced, which allows calculating the irregularity of their operation. The consumption in the gating system is the product of metal velocity in one of the feeding gates by the reduced feeding gates area. Effect of the "total feeding gates area to collector area" ratio on the metal consumption in each feeding gate and the entire system has been investigated. Calculated and experimental data are compared. In the article analysis arising and passing gas streams in the foundry mould under manufacturing high quality and artistic castings has been led. The common equation of the thermogas regime of the foundry mould has been defined. The engineer method of the gas filtration calculation duration from the relief elements foundry mould at time at time its pouring has been worked out.